Ghosh, M. and Shapiro, L. H. (2012). In vitro Ag Cross-presentation and in vivo Ag Cross-presentation by Dendritic Cells in the Mouse. Bio-protocol 2(24): e305. DOI: 10.21769/BioProtoc.305. Antigen cross presentation is important for effective immune responses to tumors and viral infections. Dendritic cells are professional antigen presenting cells and are unique in their ability to cross-present exogenous antigens on MHC class I molecules and activate antigen specific cytotoxic T cells. This protocol describes antigen cross presentation by dendritic cells (DCs) (bone marrow derived DCs and splenic DCs) in an in vitro and in an in vivo assay system using soluble ovalbumin protein. Note: The above antibodies have been tested by the authors but may be substituted with antibodies conjugated with other fluorochromes obtained from other manufacturers. Note: Perform the entire method with sterile pyrogen free dishes or plates, pipettes, tips, microfuge and conical tubes. Autoclave and filter all the buffers through 0.22 μm filter. Isolate bone marrow derived dendritic cells (BMDCs) in RPMI Medium 1640 + L-Glutamine + 10% heat inactivated FBS + 50 μM β-mercaptoethanol +1% Pen-Strep + 20 ng/ml GM-CSF and grow for 5 days at 37 °C in a 5% (v/v) CO2 incubator. Briefly, sacrifice mouse, remove the skin and clean the tissue from the femurs and tibia of freshly prepared mouse hind legs using forceps and scissors. Flush the bone marrow from both ends of the bone with 25 g needle and a 10 cc syringe filled with 1x PBS (pH 7.4) into a 50 ml tube. Centrifuge cells at 300 x g for 5 min at room temperature (RT). Lyse RBCs with 3 ml of RBC lysis buffer for 5 min at RT. Wash cell suspension twice in RPMI Medium 1640 + L-glutamine + 10% heat inactivated FBS + 50 μM β-mercaptoethanol +1% Pen-Strep by centrifuging at 300 x g for 5 min at RT. Pass cell suspension through 40 μm cell strainer. Determine the number of cells/ml. Seed 2 x 106 cells in 10 ml BMDC medium (RPMI Medium 1640 + L-Glutamine + 10% heat inactivated FBS + 50 μM β-mercaptoethanol +1% Pen-Strep) containing 20 ng/ml GM-CSF in a 10 mm tissue culture treated culture dish. Grow the cells at 37 °C under a 5% (v/v) CO2 for 5 days. Feed the cells at day 3 by adding 10 ml BMDC medium. Extract the DCs by pipetting the non-adherent or loosely adherent cells and transferring to a 50ml tube and centrifuging at 300 x g for 5 min at RT. Isolate CD8+ splenic DCs as described (Ghosh et al., 2012). Briefly, isolate total splenocytes by mechanical shear using the frosted surface of glass slides in 10 ml 1x PBS (pH 7.4). Perform RBC lysis with 3 ml of RBC lysis buffer for 5 min at RT. Wash twice with 10 ml 1x PBS (pH 7.4) by centrifuging at 300 x g for 5 min at RT. Pass the cell suspension through 40 μm cell strainer. Incubate the cell suspension (1 x 107 cells in 0.1 ml MACS buffer) with anti-mouse CD3-PE and CD19–PE Abs (1:100) in MACS buffer (1x PBS, pH 7.2 + 0.5% FBS + 2 mM EDTA) for 30 min at 4 °C in the dark. After washing twice with 3 ml MACS buffer by centrifuging at 300 x g for 10 min at 4 °C, resuspend cells (1 x 107) in 90 μl MACS buffer. Magnetically label the R-Phycoerythrin (PE)-conjugated CD3+ and CD19+ cells with anti-PE microbeads (according to manufacturer’s instruction using a MACS Multi Stand. Add 10 μl of anti-PE microbeads and incubate for 15 min at 4 °C in the dark. Wash cell suspension twice with 3 ml MACS buffer by centrifuging at 300 x g for 10 min at 4 °C. Resuspend cells in 500 μl of MACS buffer. Load the magnetically labeled cells onto a MACS column in the magnetic field of a MACS separator. The magnetically labeled CD3-PE and CD19-PE cells will be retained within the column while the unlabeled cells that are depleted of CD3+ and CD19+ cells will be in the flow through fraction. Pass the cell suspension through a MACS column twice to completely deplete CD3+ T cells and CD19+ B cells. Next, magnetically label the flow-through fraction depleted of CD3+ and CD19+ cells with CD11c and CD8 microbeads according to manufacturer’s instruction, by magnetic separation using a MACS Multi Stand. Resuspend cells in 80 μl MACS buffer. Add 10 μl each of CD11c and CD8 microbeads and incubate for 15 min at 4 °C in the dark. Load the magnetically labeled cells onto a MACS column in the magnetic field of a MACS separator. The magnetically labeled CD11c+ CD8+ cells will be retained within the column while the unlabeled cells will be in the flow through fraction. Remove the column from the magnetic field. Add 5 ml MACS buffer onto the column and place in a 5 ml conical tube. Elute the magnetically labeled CD8+ CD11c+ cells as positively selected fraction by flushing the column with a plunger. Increase the purity of the cell population by passing the cells over a second MACS column. Verify the purity of the cell population by flow cytometry. Seed 4 x 104 BMDCs or CD8+ CD11c+ splenic DCs in RPMI + 10% FBS on round-bottomed 96-well plates – 50 μl/well. Add 1 x 105 B3Z cells in RPMI + 10% FBS – 50 μl/well. B3Z is a CD8+ T-cell hybridoma that specifically recognizes OVA residues 257–264 (SIINFEKL) presented on the murine Kb MHC class I molecule (Karttunen et al., 1992) containing the LacZ reporter gene driven by transcriptional control of the nuclear factor of activated T cells (NFAT) element of the human IL2 enhancer. The presentation of the SIINFEKL epitope (SL8) to B3Z cells activates NFAT and results in the induction of β-gal synthesis by B3Z. The amount of β-gal produced can be measured by the hydrolysis of the chromogenic substrate CPRG and is an indication of the amount of SL8/Kb complexes presented on the surface of antigen presenting cells. The advantage of using the B3Z is that the LacZ assay is sensitive enough to detect antigen, expressing APCs at a low frequency and these cells are also easy to maintain in cultures. Culture these cells at 37 °C (5% CO2) in DMEM with 10% heat-inactivated fetal calf serum and supplemented with 2 mM L-glutamine, 100 U/ml penicillin, 100 μg/ml streptomycin sulfate, 0.05 mM MEM nonessential amino acids, and 1 mM sodium pyruvate. Add varying concentrations of endofree ovalbumin protein (0.625-1 mg/ml) in 1x PBS (pH 7.4). Incubate at 37 °C for 18-24 h in a 5% (v/v) CO2 incubator. Next day, spin the plate at 500 x g for 2 min at RT, gently aspirate the medium and wash the cell cultures twice with 100 μl of 1x PBS. The cells are non-adherent or loosely adherent so centrifuging the plate is necessary to avoid loss of cells during the washing step. Add 100 μl of 0.15 mM of CPRG solution in CPRG lysis buffer (0.5% NP-40 in 1xPBS). Incubate at RT in the dark for 6-24 h.
Transfer the contents to flat bottom 96-well plate by pipetting. In this step centrifuging the plate is not necessary as the cells are already lysed. Avoid the bubbles present in the wells while transferring the contents. Read the absorption at 570 nm, with 650 nm as the reference wavelength in a microplate reader. BMDCs incubated with B3Z but without the antigen serve as background control. Harvest the spleen and lymph nodes (inguinal and mesenteric) from Rag-/- CD45.1 OT-1 mice and isolate single cell suspension by mechanical shear using the frosted surface of glass slides in MACS buffer (1x PBS + 0.5% FBS + 2 mM EDTA). Lyse RBCs (for spleen only as processing the lymph node does not require lysis of RBCs) with 3 ml of RBC lysis buffer for 5 min at RT. Wash cell suspension twice in 1x PBS by centrifuging at 300 x g for 5 min at RT. Pass cell suspension through 40 μm cell strainer and wash twice with 3 ml MACS buffer by centrifuging at 300 x g for 5 min at RT. Resuspend 1 x 107 cells in 90 μl MACS buffer. Add 10 μl of CD8a microbeads per 1 x 107 cells in 90 μl MACS buffer and incubate for 15 min at 4 °C in the dark. Magnetically label the CD8+ cells with CD8 microbeads (the microbeads are not conjugated to any fluorophore). Subject to magnetic separation using MACS column according to the manufacturer’s instruction using a MACS Multi Stand. Load the magnetically labeled CD8+ cells onto a MACS column in the magnetic field of a MACS separator. The magnetically labeled CD8+ cells will be retained within the column while the unlabeled cells will be in the flow through fraction. Remove the column from the magnetic field. Add 5 ml MACS buffer onto the column and place in a 5 ml conical tube. Elute the magnetically labeled CD8+ cells as positively selected fraction by flushing the column with a plunger. Increase the purity of the CD8+ cell population by passing the cells over a second MACS column. Resuspend 1 x 107 cells/ml of CD8+ T lymphocytes and label with 10 μM of CFSE proliferative dye for 10 min at room temperaturein the dark (add 2 μl of 5 mM CFSE dye to 107 cells in 1 ml 1x PBS). Wash cells once with 10 ml 1x PBS and resuspend in sterile 1x PBS to a concentration of 1 x 107 cells/ml. On day 0, adoptively transfer 1 x 106 CFSE labeled CD8+ T lymphocytes to mice (0.1 ml of 1 x 107cells/ml) intravenously. On day 1, after 24 h, challenge mice with 100 μg of endofree soluble ovalbumin protein/mice in 0.1 ml of 1x PBS intradermally by injecting into the right flank of the mouse. After 3 days, harvest spleen and lymph nodes (inguinal and mesenteric) by mechanical shear as in step 1. Briefly, isolate total splenocytes by mechanical shear using the frosted surface of glass slides in 10 ml 1x PBS (pH 7.4). Perform RBC lysis with 3 ml of RBC lysis buffer for 5 min at RT. Wash twice with 10 ml 1x PBS (pH 7.5) by centrifuging at 300 x g for 5 min at RT. Lyse RBCs (for spleen only as processing the lymph node does not require lysis of RBCs) as in step 2 and isolate single cell suspension in 5 ml FACS buffer (1x PBS+ 2% heat inactivated FBS). Pass cells suspension through 40 μm filter. Immunostain 1 x 106 cells with anti-CD45.1-APC (1:100) and anti-CD8-PerCpCy5.5 (1:100) antibodies in 0.1 ml FACS buffer for 30 min at 4 °C in the dark in FACS tubes. Wash cells thrice with 3ml FACS buffer by centrifuging at 300 x g for 5 min at RT. Fix cells with 0.5 ml 2% Paraformaldehyde in 1x PBS (pH 7.4) for 30 min at 4 °C. Wash cells thrice with 3 ml FACS buffer by centrifuging at 300 x g for 5 min at RT. Resuspend cells in 0.5 ml of FACS buffer. 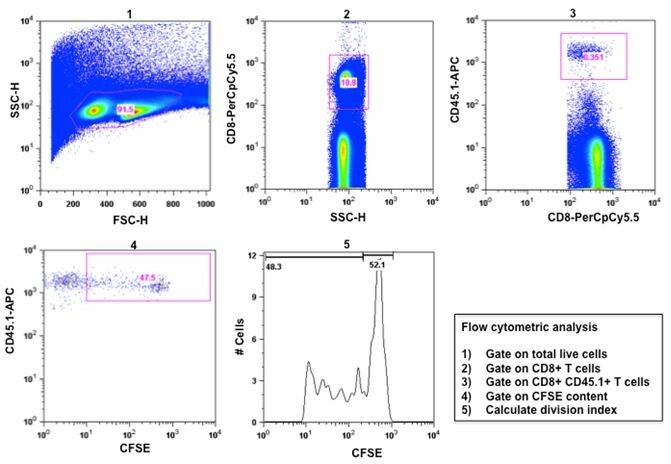 Analyze cells by flow cytometry in LSRII for CFSE content (488 nm wavelength) in CD8+ CD45.1+ T-lymphocytes. Calculate the division index as the average number of divisions for all the cells in the original population using FlowJo software. Figure 1. Activation of CD8+ T lymphocyte activation by in vivo cross presentation of soluble OVA antigen. CFSE-labeled CD45.1+ OT-I cells were intravenously injected into mice, followed by intradermal administration of soluble OVA after 24 h. 3 days later splenic lymphocytes were isolated and stained with anti-CD8-PerCpCy5.5 and anti-CD45.1-APC antibodies and OT-I cell proliferation was analyzed by flow cytometry. 1. Total splenocytes were gated on live cell population. 2. Total live cell population was gated on CD8+ T- cells. 3. Total CD8+ T-cell population was gated on CD8+ CD45.1+ T-cells. 4. CFSE content of CD8+ CD45.1+ OT-1 cells was determined as a measure of T-cell proliferation. 5. Number of cell division in the CD8+ CD45.1+ T-cell population indicated by the division index was determined by FlowJo software. We thank Drs. Sreyashi Basu and Pramod K Srivastava, UConn Health for advice and help. The B3Z CD8+ T cell hybridoma was a gift from Dr. Pramod K Srivastava, UConn Health. In addition, we thank the UConn Health Flow Cytometry Core. This work was supported by Public Health Service grants, the National Cancer Institute (CA-106345), and the National Heart, Lung, and Blood Institute (HL-70694). Ghosh, M., McAuliffe, B., Subramani, J., Basu, S. and Shapiro, L. H. (2012). CD13 regulates dendritic cell cross-presentation and T cell responses by inhibiting receptor-mediated antigen uptake. J Immunol 188(11): 5489-5499. Karttunen, J., Sanderson, S. and Shastri, N. (1992). Detection of rare antigen-presenting cells by the lacZ T-cell activation assay suggests an expression cloning strategy for T-cell antigens. Proc Natl Acad Sci U S A 89(13): 6020-6024. How to cite: Ghosh, M. and Shapiro, L. H. (2012). In vitro Ag Cross-presentation and in vivo Ag Cross-presentation by Dendritic Cells in the Mouse. Bio-protocol 2(24): e305. DOI: 10.21769/BioProtoc.305. It a very useful protocol to me and my group. Tanks a lot for the authors! Are the B3Z cells commercially available? If not how might I obtain them? Thank you for your kind comment. The B3Z cells used in the study was obtained from Dr. Sreyashi Basu and Dr. Pramod Srivastava in the Department of Immunology, University of Connecticut Health Center, Farmington, CT 06030.